Shopping for a New Garage Floor Coating? A properly applied garage floor finish is an investment to both protect and beautify your home. Your contractor should be willing to give you the manufacturer’s name and telephone number for all products they recommend. You have a right to know what products will be used in your home.At GarageFloorCoating.com, we use proprietary, green products from industry leader Eco-CorFlex. You are welcome to inspect our manufacturer’s website or call them at any time. For a quality floor finish, professional-grade products are essential. Proper application of these compounds requires technicians who are trained in surface preparation, application, and finishing techniques. If they say they are certified ask “May I please see your certifications?”, ensure that prospective companies show you evidence of their training in these specific products.All GarageFloorCoating.com dealers and franchisees are certified, trained in the use of standard operating procedures and attend mandatory annual training sessions. Today’s premier coatings are environmentally friendly. Unfortunately, many companies still use older products that have hazardous levels of VOCs. Make sure the company you choose uses products that have been rated as “Zero” or “Low VOCs” by an approved ASTM International test method. 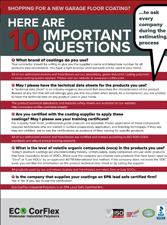 If the company does not know the VOC level offhand, you can find this information on the product technical data sheet or by calling the manufacturer.All products used by GarageFloorCoating.com dealers and franchisees are rated Zero or Low VOCs. Yes or No. If yes, ask to see the certification.GarageFloorCoating.com exclusively uses Eco-CorFlex products. Eco-CorFlex is an EPA Lead Safe Certified firm. The correct answer to this question is: “It depends.” You want to avoid companies that automatically guarantee a one-day process before testing your concrete for moisture. The moisture content of a concrete slab can vary widely from home to home, even in dry climates like Arizona. There are good products on the market that allow for one-day installations when the moisture profile is correct, but applying these products improperly can lead to blistering and bubbling of the finished surface.GarageFloorCoating.com tests all surfaces first, then selects a floor finishing solution that fits your needs and schedule to ensure a long-lasting finish. First, make sure your contractor tests for moisture! If they do not as part of their process, find someone else.Next, ask “What brand of moisture meter do you use?”, make sure the contractor uses only a Tramex brand moisture meter. This device is the tool recommended for accuracy by the National Society for Protective Coatings. Moisture meters purchased at a big-box home improvement store will not yield accurate results.All GarageFloorCoating.com licensed dealers and franchisees use proper Tramex moisture meter equipment that’s maintained and calibrated monthly. This question will let you know if the firm you are interviewing knows floor coating products. Polyurethane should not be used as a topcoat in a garage—ever. Hot tires, brake fluid, and motor oil can all permanently stain a polyurethane topcoat. Moreover, polyurethane is flammable and should never be applied as a topcoat near gas heating elements.GarageFloorCoating.com dealers and franchisees do not use polyurethane topcoats in any garage. There are two types of concrete, concrete that is cracked and concrete that is going to crack.Due to cracked concrete’s potential for shifting, you should avoid technicians who say their product can simply be applied in the cracks to fill. Instead, look for firms that use an elastomeric substance to provide a flexible surface on which to apply the floor coating. Without elastomeric crack treatments, you are setting yourself up for continued cosmetic issues (and more payments) in the future.All GarageFloorCoating.com dealers and franchisees are trained in proper surface treatment and crack repair. Finally, make sure you compare warranties with all companies you interview to finish your garage floor. You want to enjoy the results for many years to come!GarageFloorCoating.com dealers and franchisees all offer competitive, comprehensive warranties for your peace of mind. Asking these questions is your first step in getting a beautiful, durable garage floor finish. If you would like more information about the process or would like to find a licensed GarageFloorCoating.com dealer in your area, please contact the GarageFloorCoating.com corporate office at 877-324-2628.